And so we start on the loop. It turns out that Sak hasn’t been on most of this route, so it’s as new for him as for me. Asking around the bar it seems most of the locals and the foreign residents haven’t done it either. And I get a few incredulous looks along the lines of you’re going all that way on that road? I’m not doing the full loop via Mae Sarieng, but taking a short cut through the middle, cutting across the N-S mountain ranges on a less popular road. Consensus is this is even more risky. 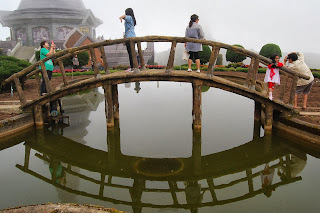 Anyway, the first section is well known to me, to Doi Inthanon, and straightforward. It turns out Sak hasn’t even been to this, the highest mountain in Thailand and also regarded as a sacred site by Thais, so he’s thrilled to be going there. We first have to traverse the boring linear development along the highway south of CM, but soon turn off along the pleasant wooded road that rises towards the mountains. We stop at the Vatchirathan waterfall, in full spate just after the rains, and through the tribal villages where they grow temperate fruit and veg that can’t grow at lower, hotter altitudes. On up to the royal chedi. These are modern granite faced monuments to the Thai king and queen consort, surrounded by pleasant gardens, and when we visited swathed in cloud. A large sign there states that this is the highest point on Doi Inthanon ‘measured by air pressure’. I’ve puzzled at this each time I’ve passed it. A few kilometers ahead the main peak is at least 100m higher at 2565m. Does some quirk of the prevailing wind reduce the pressure on this side of the mountain? It’s as if in the eyes of the Air Force (who built and manage the chedi) the barometer trumps the theodolite. Now we turn off the Doi Inthanon road, after driving up and down a few times failing to find the turning, into new territory for me, the road to Mae Chaem. Only 23km but probably the most difficult road I’ve driven. It twists and turns seemingly round every tree and rock, and local drivers have little sense of keeping to the left, so lots of welly on the horn is necessary on blind bends. If the other 300km are like this… But the countryside is spectacular. We cross a series of passes and then drop into the hidden valley of Mae Chom in the golden light of late afternoon. 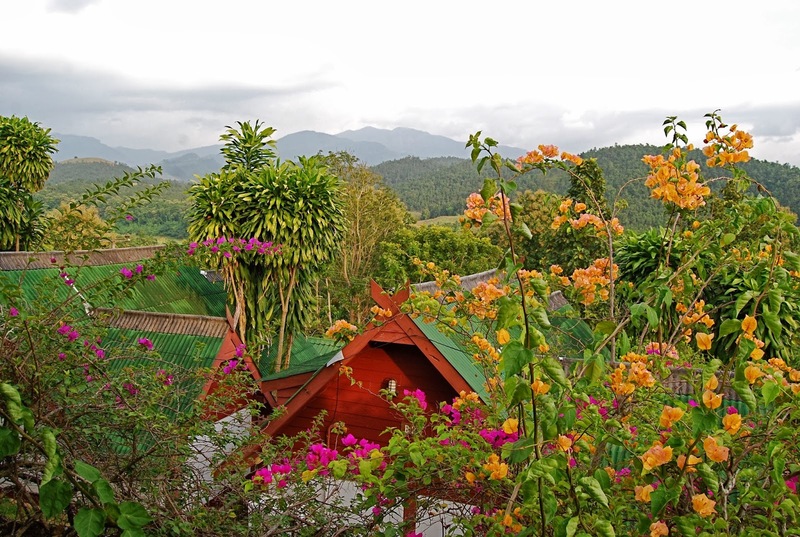 We stop at a guest house with the most amazing view across the valley. We are greeted by a very handsome looking teenager, who looks entirely European – light brown hair and eyes, tall, with a perfect tan. However, he’s a native Thai speaker with barely any English. This resort must once have been very pleasant if simple, with small villas getting the most of the view, in extensive mature gardens. However it looks like it hasn’t had any maintenance for years and is in rapid decline. The boy and another almost the same age, mope all day at a table in the restaurant they have colonized with the detritus of youth, playing computer games. They seem to be the only staff. There is a swimming pool, however, that appears to be properly maintained, so we spend our time there gazing at the view. A middle aged European man is sunbathing: he merely grunts and stares when I say hello. I take him to be one of the guests, but we keep seeing him. At dinner, he sits alone at the corner of the largest table, beer in hand, occasionally glowering at the guests. Eventually I realize he is the Nordic owner, and it feels like we are bit players in some Bergmanesque tragedy. Great dinner though, served up by the enigmatic young man (perhaps the owner’s son). Pra taptim (a plump local river fish) with ginger and a fierce green chilli sauce, red chicken curry with beans and green tomatoes, and tom kah kai. 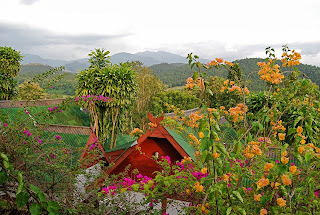 In the morning we decide to get out of the atmosphere here as fast as possible; and we have the longest leg of our trip ahead of us, 160km to Mae Hong Son.